Professional Quality, beautifully made right in North Carolina. The knitted-in Dita "D." logo is on the front of the socks. 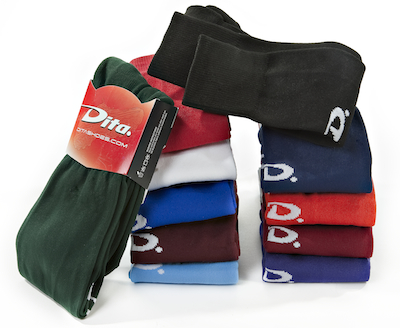 The socks are 75% Polypropylene, 13% Nylon,3% Lycra, and 9% Elastic, to keep a snug fit. Large size fits most adult men and women. Medium size fits from US Mens 4.5-6.5, Womens 5-8. Small size fits YOUTH under 4'2" tall.